Preheat oven to 350 degrees F. Grease the bottom and 1/2 inch up the sides of two 9x5x3-inch, three 8x4x2-inch, or four 7 1/2x3 1/2x2-inch loaf pans; set aside. In a large bowl stir together flour, baking soda, 2 teaspoons cinnamon, salt, and nutmeg; set aside. In an extra-large mixing bowl beat granulated sugar, brown sugar, and oil with an electric mixer on medium speed until combined. Add eggs; beat well. Alternately add flour mixture and the water to egg mixture, beating on low speed after each addition just until combined. Beat in pumpkin. Spoon batter into the prepared loaf pans, spreading evenly. Bake for 55 to 60 minutes for 9x5-inch loaves, 45 to 50 minutes for 8x4-inch loaves, 40 to 45 minutes for 7 1/2x3-inch loaves, or until a wooden toothpick inserted near the centers comes out clean. Cool in pans on wire racks for 10 minutes. Remove from pans. Cool completely on wire racks. Wrap and store overnight. 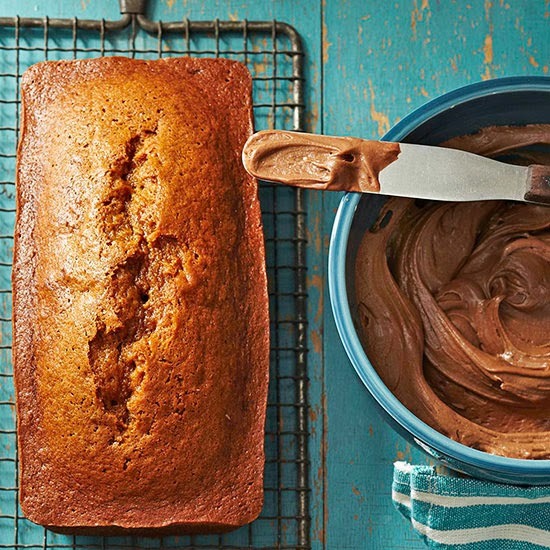 For cocoa-spice frosting, in a small mixing bowl beat butter on medium speed for 30 seconds. Beat in 1 cup of the powdered sugar, the cocoa powder, 1 tablespoon milk, 1/2 teaspoon cinnamon, coffee powder, and vanilla until combined. Beat in the remaining 1 cup powdered sugar. Beat in additional milk, 1 teaspoon at a time, to reach spreading consistency. Spread the tops of loaves with cocoa-spice frosting before slicing.